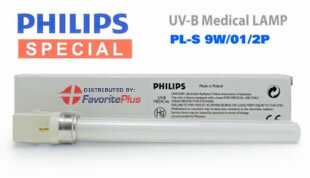 Philips PL-S 9W/01/2P Replacement Bulb for UVB Phototherapy Lamps including our DermaHealer & Dermalight-80. Special Philips UVB Narrowband lamps for medical use are safer and more effective than any other lamps in their class. Philips PL-S 9W/01/2P UV-B lamps emit only a very narrow wavelength band which peaks at 311 nm: the most effective waveband for the treatment of psoriasis and vitiligo. This results in much shorter exposure times and less potential side effects as itching and reddening of the skin. All of this makes them ideal for phototherapy treatment of diseases such as psoriasis, parapsoriasis, vitiligo, atopic dermatitis, and mycosis fungoides. In addition the lamps are also suitable for home therapy, because the overall dosage of this narrowband radiation can be closely controlled. Don't settle for poor imitations that could be harmful to your health. Order the original Philips PL-S 9W/01/2P replacement bulb that is certified to be the most effective on skin. Products I am happy reach very soon. Next time, here, I want to buy.